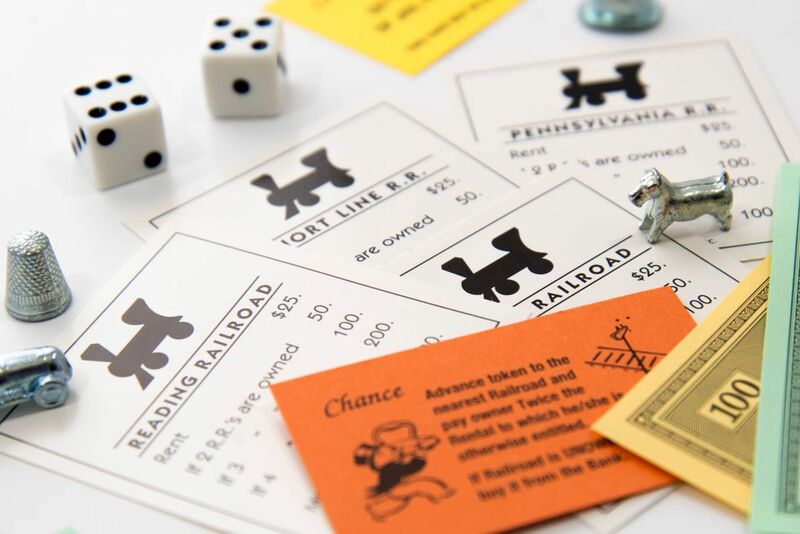 The railroads are great properties to own in the game of Monopoly, but the rules surrounding railroads can be complex. If you own all four railroads, but one is mortgaged, how much rent do you collect when someone lands on it or one of the other railroads? Rent goes up with the number of railroads you own, but no rent is owed when someone lands on a mortgaged property. If a railroad is unowned, a player landing on it may buy it for the listed price. If you land on it and don't want to buy it, it goes to auction at a price starting at the listed price or above. The high bidder then purchases the railroad. The rent for railroads depends on how many railroads the player owns. If you own one, the rent on it is $25. If you own two, you get $50 rent from anyone landing on either, if you own three then you get $100, and if you own all four railroads then the rent is $200. However, the owner must ask the player for the rent before the next player rolls the dice. If you are inattentive, you may lose the rent. When you don't have enough money to pay rent or a fee, you can mortgage properties to the Bank to get money, or you can sell the deed to other players. Players cannot loan money to each other; selling is the only option for transferring money from player to player. To have the mortgage lifted, the owner has to pay the bank the amount of the mortgage and an extra 10 percent as interest. While a railroad or other property is mortgaged, the owner can still sell it to another player at any price you agree upon. Now the new owner has the option of lifting the mortgage by paying off the mortgage price plus the 10 percent interest. If the new owner chooses to wait rather than paying off the mortgage, they must pay 10 percent of the mortgage price at the time of purchase. Then when they pay off the mortgage later, they owe an additional 10 percent interest. It is to their advantage to pay off the mortgage at the time they buy it from the other player so they don't incur this extra interest charge. In Monopoly, a mortgaged railroad follows the same rules as other mortgaged properties. If an opposing player lands on your mortgaged railroad, they pay no rent. You, the owner of the railroad, collect zero dollars. However, this does not affect the rent if a player lands on the other railroads you own. If you own all four railroads, when they land on any of them that aren't mortgaged, they owe $200. The rent is not discounted because any other of your railroads is mortgaged. The fact that one railroad (or one property in a color group) is mortgaged does not affect the rent owed when players land on other railroads (or other properties in that same color group).